5:50–Into the home stretch for Lent, Hy-Vee dietician Tracey Sauke returns to share a few more ideas for meatless meals. 6:35–Veteran ag reporter Ken Root analyzes demand for U.S. beef, pork, and chicken for the remainder of 2019 when he talks with KXEL’s Jeff Stein. 7:35–TV9 Meteorologist Kaj O’Mara says we’ll see a little bit of all that spring has to offer from a weather standpoint this week. 7:50–As a college admissions scandal and investigation continues to make national news, Cindy Thompson of Iowa State University Extension talks about appropriate (and completely legal) ways parents can help prepare children for their futures. 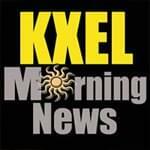 Plus the weather every 10 minutes, 50 percent more news than before, agribusiness information at :15 past each hour, and sports at :30 past each hour…a great way to start the day…the KXEL Morning News with Tim Harwood, Jeff Stein, and Mark Morris, Tuesday between 5 and 8 a.m. on News/Talk 1540 KXEL.